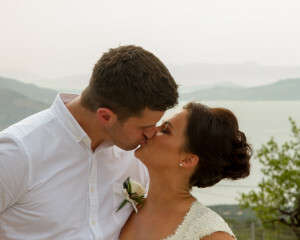 Emma and Ash’s Wonderful Wedding on Crete! It’s been a whirlwind few weeks that I shall cherish for always. I have been happier than I ever could have imagined and it’s all because of Emma and Ash’s wonderful wedding! Prepare yourselves for an epic posting! 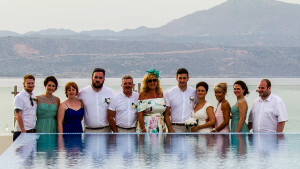 For me it started just over two weeks before the wedding when Emma, Ash and my gorgeous Grandson, Ralph arrived in Crete on Tuesday 17th May. 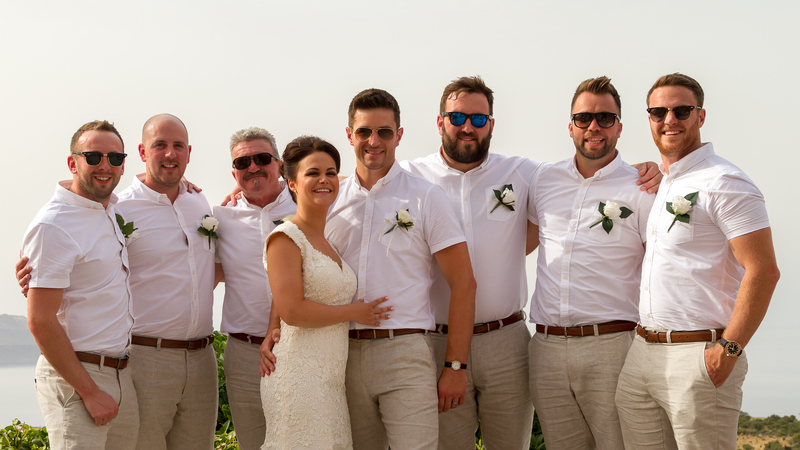 From that moment on we were all in ‘wedding mode’… although I was in ‘Ralph mode’ for quite a lot of the time! Well what did you expect? After all, I am his doting Yaya – the Greek word for Gran or Nana. In all, I had over three weeks of blissful time, playing with and helping to look after Ralph. It’s amazing how many details were still to be finished and finalised during the wonderful ten days that Emma, Ash and Ralph stayed with me. We spent a day in Chania, buying toys for the children – like the favours of Olive Oil and Raki that we had already arranged for the adults. There was a family meal scheduled for the night before the wedding and Emma and Ash wanted to make sure they booked early. Having completed all our errands, we had coffees and cake and then took a leisurely stroll all along Chania’s beautiful Harbour Front, past all the yachts and boats and right to the end where the ruined walls and buildings give access to the Lighthouse. When Ash’s parents, Phil and Angela, together with his Aunts and Uncles arrived on the following Tuesday, life naturally began to get much busier, socially. They had all decided to make this wedding into a two week holiday! Emma, Ash and Ralph all moved into the Bridal Suite of the Almyrida Residence Hotel ten days later, for the wedding week. 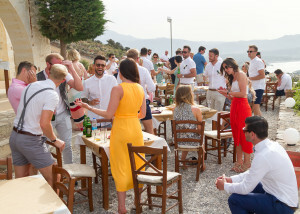 The wedding was due to take place on the Thursday following and guests started flocking into Almyrida and Plaka like bees to a honey pot! Honestly, there were so many people to meet and greet over those next five days! 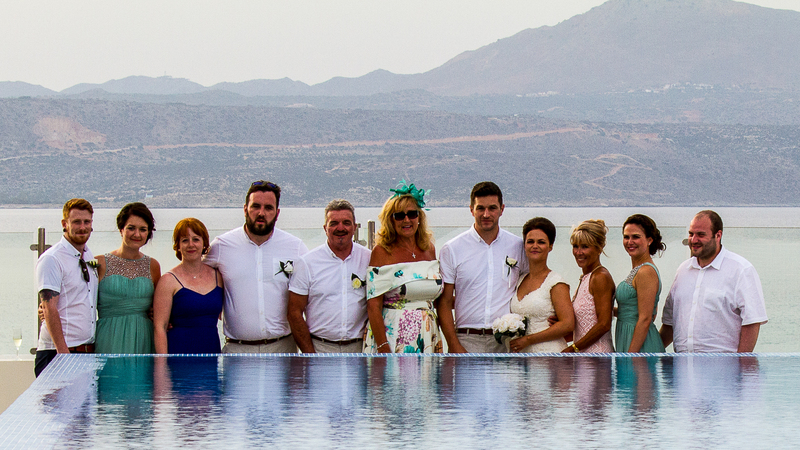 It was almost surreal to have so many family and friends staying here on Crete – all at the same time! It was like we’d all gone on holiday together and we were lapping it up and loving every minute of it! 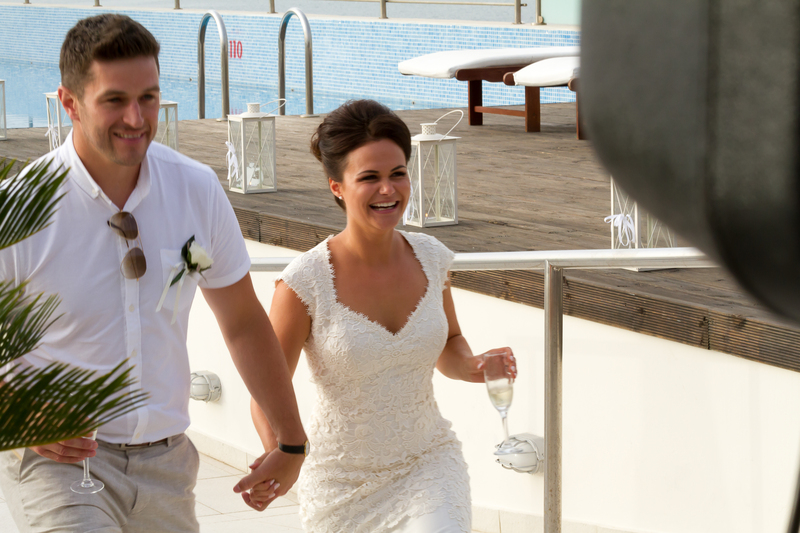 I can’t remember a time in Zoe’s, Emma’s or my life that was ever as momentous and memorable as this whole wedding was – it was just so exciting! My daughter Zoe and her fiancé, Rich arrived on the Tuesday before the wedding, along with my Mum too. 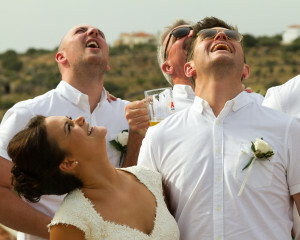 They all stayed with me and on this busy day too, we had a rehearsal up at the Chapel as well as Emma’s Hen Party. Although both Emma and Ash had already had their Hen and Stag do’s before they came to Crete – by popular demand, everyone insisted on them having another here on Crete. So on the Monday Ash took his male family and friends – first to go-cart racing in Chania and then onto a nightclub later. Emma’s Hen party kicked off on Tuesday night (Zoe only just having arrived in time for it!) in Atlantis bar in Almyrida. We all remained there for several hours and then a crowd went on to the nightclub in Chania. 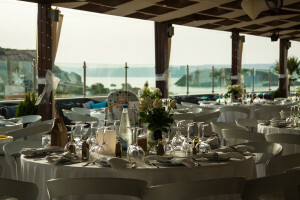 On all the other days, we ate out every lunchtime and dinner together with all our other family members who were staying in the Almyrida Resort Hotels and large holiday villas. There are so many good and lovely restaurants to dine in, both in Almyrida and Plaka. So reasonably priced too, and you always get a free dessert and Raki after every meal. We all enjoyed some really fabulous family meals together. Enjoying a pre-dinner drink on Almyrida Residence’s Rooftop Garden. 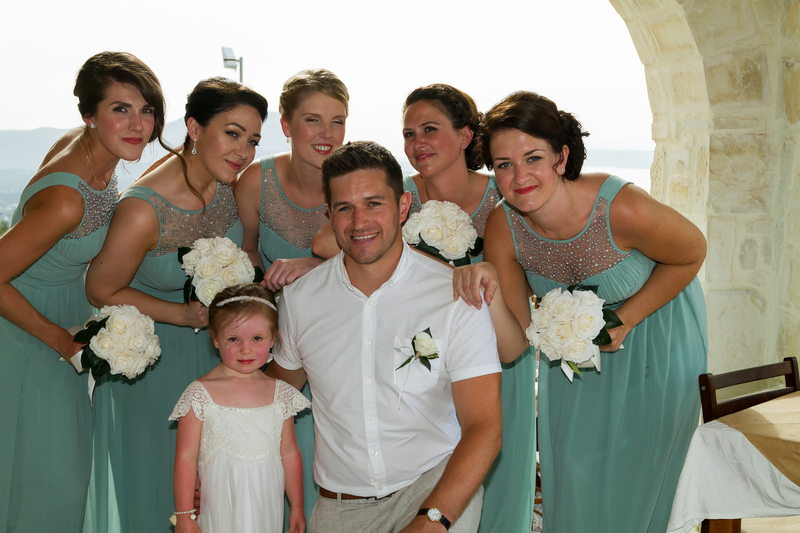 From left to right – Zoe, Rich, Brother-in-law, Mike, Niece Sophie, Me, Mum, Niece Hannah and Sister, Karen. The following evening, the night before the wedding we all boarded a large coach to ferry around forty relatives to Chania for the ‘Big Family Meal’. This is a tradition so I’m told, to enable the Bride and Groom’s family members to meet each other. This event in itself took much to organise and was a great success. Emma and Ash wanted everyone to see Chania’s port and harbour in all its glory and the only way to do that is to walk it! However, the coach was unable to drop us off where we wanted and so the walk ended up being much longer than we had anticipated! This was fine for the majority of the families but the odd few older members suffered a little – although I have to say that my Mum took it all in her stride! The Restaurant is situated just behind the Harbour front, and is set in the open-air grounds of a ruin. Once in the restaurant we mixed ourselves up a little and enjoyed a great meal, chatting while live Greek music played in the background. I wish now I’d taken some photos, but at the time I was too busy socialising to bother! The food and the service were really quite good considering we were such a large party and the evening was a great success. Finally it was the Wedding Day – and well that was truly something else! There was a little hitch with the seating plan in the morning. This meant a rush visit to the Hotel at lunchtime, armed with blackboard paint and chalk pen to create another table. We had put too many people on some of the tables. 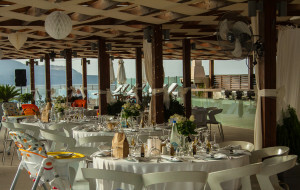 In the end there were ten full tables as well as the top table and I believe we had one of the largest non-Greek wedding receptions the Almyrida Residence Hotel has ever held. 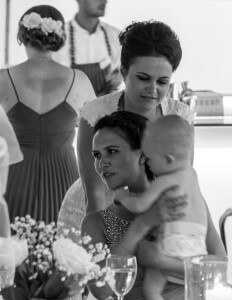 At around 3pm that afternoon, my Mum and I drove to the Almyrida Residence Hotel and I went straight to the suite to help Emma into her dress. There was just the two of us for that briefest of times and we were quite nervous as the enormity of this special day finally kicked in! 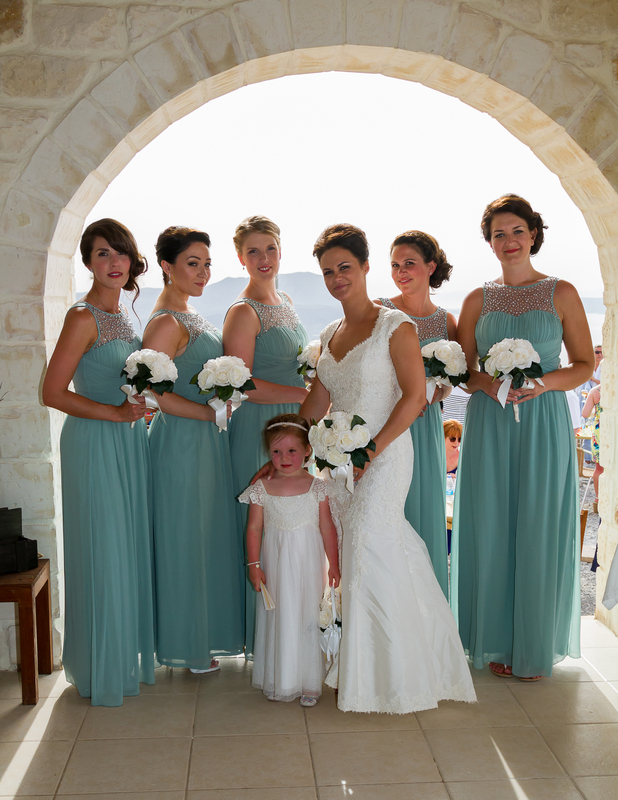 We spent time with all the bridesmaids – Zoe of course being one of them. 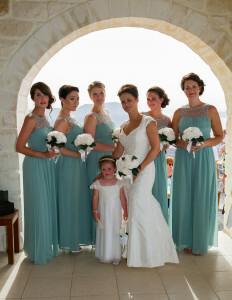 There were five bridesmaids in all as well as a little flower girl – Emma’s God-Daughter, Isabelle. 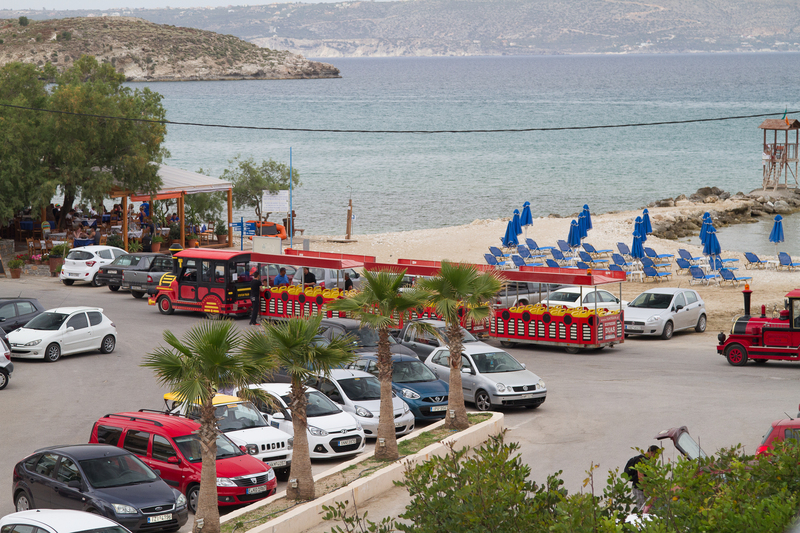 We all watched from the Hotel balcony as the two red Noddy trains left the large car park, laden with over 90 guests! 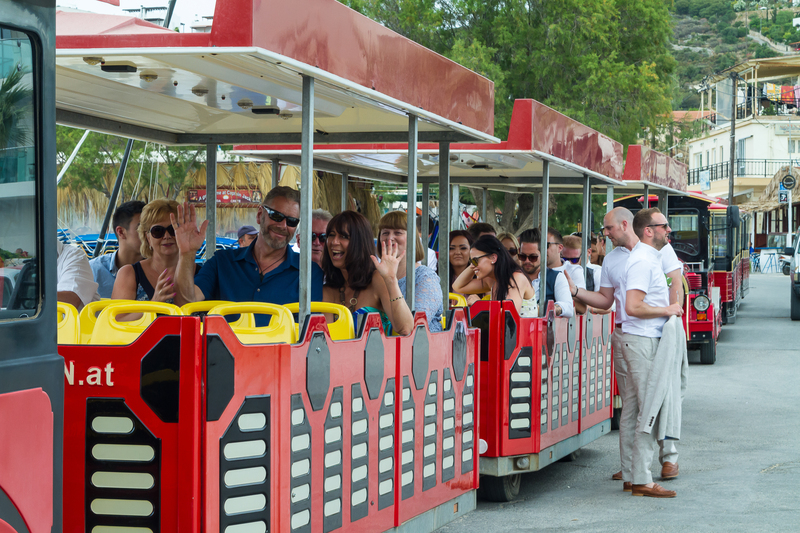 These little open-air trains were a great and truly fun way to transport everyone to the Chapel. They wound their way through the villages of Plaka, Kampia and Kokkino Chorio – climbing steadily up the mountain to the little Chapel of St George’s Retreat. This journey took about 20 minutes to reach the top and after the guests had stepped off the trains, they were all given iced Pimms and lemonade before being seated for the ceremony. The trains arrive to pick up the guests! The Bride, Emma, the bridesmaids, flower girl and I did not arrive in style. Emma did not want everyone seeing this part – preferring the guests to be seated and settled before her walk down the aisle. How we all arrived I shall leave to your imagination because I cocked up on this detail and have no desire to relate the tale and mar, no matter how slightly, this wonderful occasion! It was a very hot day and naturally, Emma had factored this in as part of the preparations. We were all provided with pretty white wooden fans. Luckily, though not for the photos – there was a fine cloud cover and this took out some of the heat. Walking Emma down the aisle will always be one of the proudest moments of my life. The ceremony itself was very emotional in parts and many tears were shed – especially by Emma and Ash! I was standing just behind Emma and I witnessed all their emotions, making me cry all the more. Such tears of happiness are priceless! Each time I’d glanced over at little Ralph, who was in his Paternal Grandfather’s arms – an exact mini duplicate of Ash – I would fill up again! When Ash’s sister and also a bridesmaid, Danielle – sang ‘True Colours’ so beautifully – emotion was running high for everyone. Straight after the ceremony we all climbed up the steps from the Chapel to The Retreat for further refreshments and photos. Capturing the stunning 360 degree scenery that The Retreat boasts, a camera drone hovered overhead; taking what I’m sure will be amazing video coverage of the whole event! 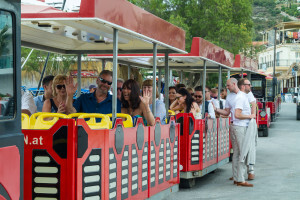 Then it was time for all the guests, including Emma and Ash, to board the open-air trains for the journey back down the mountain and into Almyrida. We all walked off the trains and onto the beach for large group and family group photos. 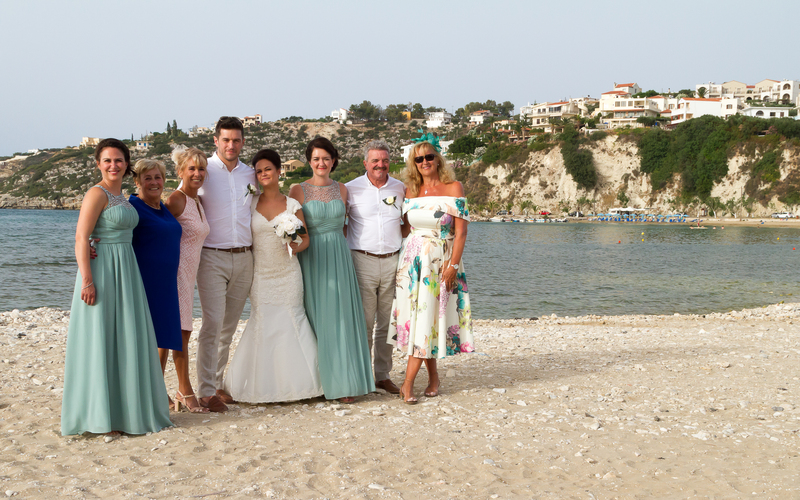 Afterwards, at the Almyrida Residence Hotel the guests were given shots of honey raki and nibbles whilst the photographer and videographer took Emma, Ash, Ralph and I to the other end of Almyrida for some special family photos of the three of them. 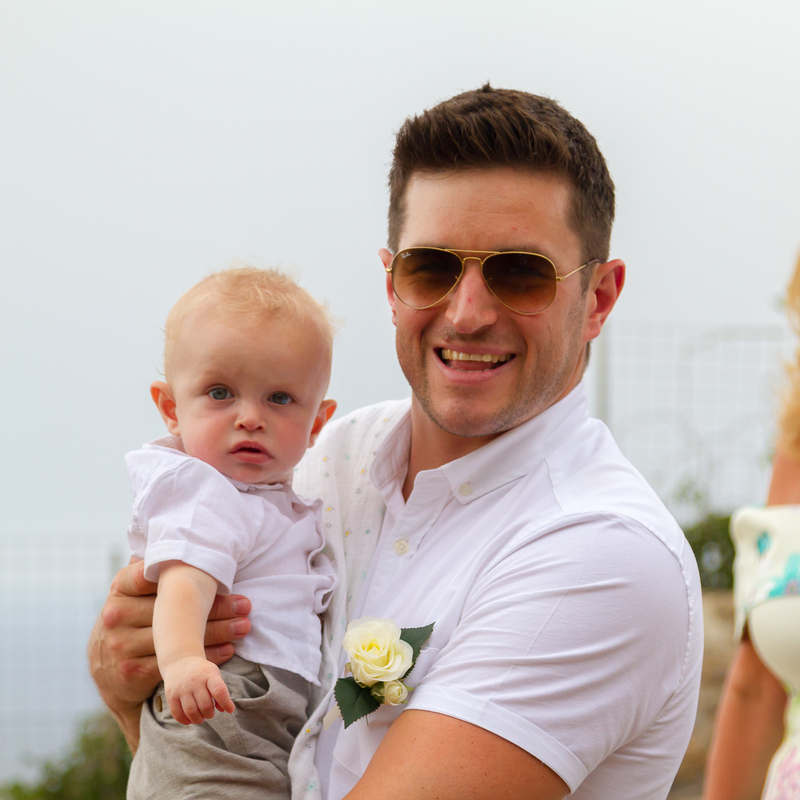 I especially loved the walk with Ralph in my arms, happily smiling and baby chatting the whole time – as if he too was celebrating the marriage of his parents! Looking up at the hovering Camera Drone! At around 7.30pm everyone moved upstairs to the large Roof Garden for the reception dinner. We formed a huge tunnel for Emma and Ash to walk through, sprinkling confetti all the way! It looked so lovely up there on the roof – so beautifully decorated, thanks to Neisha, the very competent wedding planner the Hotel had provided. The food was excellent and the service exceptional. This wedding was so large it completely filled the space to capacity. The wine was free flowing and I was so happy and proud to be sitting at the top table with Emma and Ash on my left and Zoe and Rich on my right. After dinner it was time to begin the speeches and I was first up. Strangely enough – or maybe not, as I had had a couple of glasses of wine before (but not too much, I hasten to add! ); I wasn’t as nervous about delivering my speech as I thought I would be. Yes, I was still nervous but amazingly I made it without any real hitches. This I must attribute to all the careful prep work I did for it, making sure that I mentioned everything I should, kept it to about 5 minutes long and had memorised the speech before Emma, Ash and Ralph first arrived over two weeks ago! All these things making me feel more confident, but most important of all, was that everything I said came straight from the heart. Good evening Ladies and Gentlemen. For those of you that don’t know me, my name is Michaela and I am the very proud Mother of the Bride. 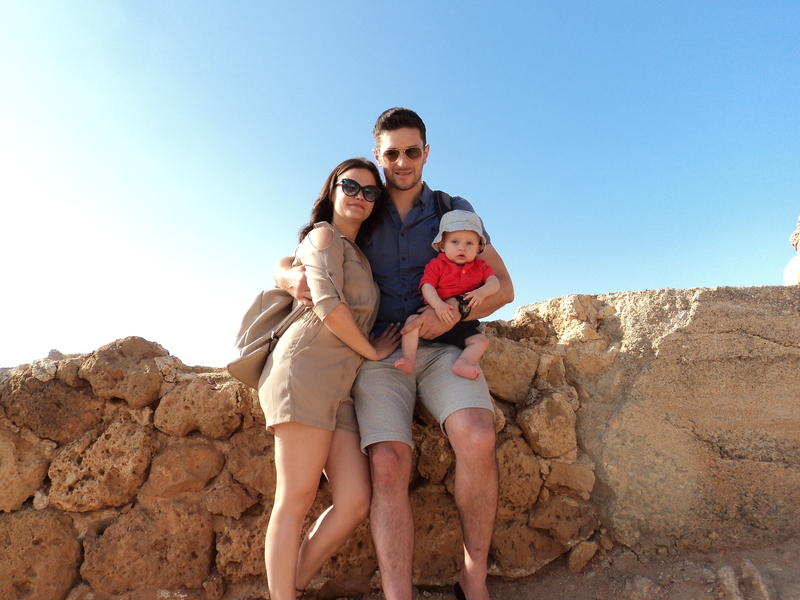 Firstly I would like to offer a special welcome to Ash’s parents, Phil and Angela… and to all the relatives and friends who have travelled from different areas of the UK and beyond, to be right ‘here’ – on this Beautiful Island of Crete. Thank you all for coming to share in these joyful celebrations for the marriage of Emma and Ash. A very warm Welcome to you all. I felt so proud this afternoon… walking Emma down the aisle. So very proud of this lovely young woman she has become. I love her so very much. She is warm-hearted, caring, generous and thoughtful… as well as being fiercely loyal to all her family and friends. Even as a child, Emma has always been focused – clear in her mind about what she wanted to achieve. Always willing to put in all the effort and go that extra mile. I have many fond memories of Emma…. as a child, as a young girl, as a teenager, and as a beautiful young woman finding her way in an ever-increasingly tough and demanding world. A particular memory springs to mind – which when I remember it – always makes me smile, and wonder how on earth she did it?!! When Emma was around 14 years old, I came home from work one night to find that she had detached and dismantled her built in desk units and reassembled them – all drilled into place – in the opposite corner of her bedroom!! Another memory I have and which we always laugh about, is the time Emma drove into our new shed! I had taken her out for some driving practice and as we approached home again, instead of rolling up the sloping driveway and coming gently to a stop, Emma put her foot on the accelerator, driving straight into the shed and moving it several feet, just narrowly missing the house! She thought she needed power to get up the slope, when in fact, momentum was enough! Emma has worked so hard to achieve so much… from so little. Despite all the odds – and there have been many – she has reached her goals through her own sheer determination… and with them, the happiness she so deserves. I believe Emma now has everything she could wish for in Ash, and gorgeous Baby Ralph… born of their love and commitment to each other. As a mother now herself, I can see that she is a loving and relaxed Mum and happy Baby Ralph is surely proof of it! I know that Emma and Ash love each other very much and that they will have a Wonderful Happy Marriage and future Life together. Now I’d like to offer Ash a very warm welcome into our family. But the best speech of the day surely had to be awarded to Ash. His nerves – yet the way he coped with them, his words so poignant and heartfelt, his humour and happiness mingled with his tears – just brought the house down! He told such a beautiful love story about Emma and himself, making so many people cry and most of all, his bride, Emma. Thank God for waterproof mascara! If I had a copy of Ash’s memorable speech I would definitely post it up here. My Brother-in-law, Mike also spoke very well for Emma as did her close friend, Nasim. On Ash’s side, he had two best men who delivered their speeches together and then there was a final speech from another of Ash’s close friends – because he has so many! Emma and Ash kick off the party with their first dance! As soon as the speeches were over, the music was cranked up for Emma and Ash’s first dance and then the party really began to swing! For the next two hours we mingled, drank more and danced to the music the DJ was using from Emma and Ash’s playlist. Knowing that we could only play the music loudly until midnight (think of all the other guests staying at the hotel?! 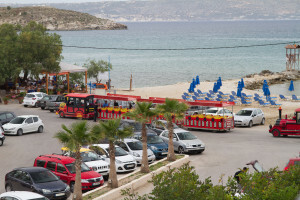 ), and as previously arranged – we all trooped off to Nikita’s Beach Bar in Almyrida. This lovely bar is situated right on the beach and was the perfect place for ‘The After Party’! 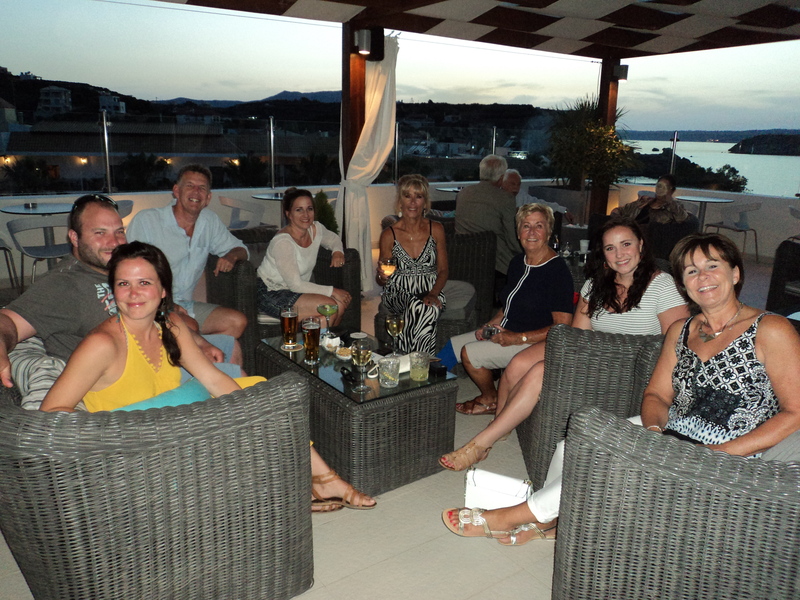 So party we did – some of us ending up in the soft cool sand and then warm sea water, just a few feet from the bar! Many local Greeks and holidaymakers also joined in the fun and it rocked for hours until 6am! I managed to last up to about 4am, when I finally staggered home on foot with my friend, Caroline! Oh what a wedding that was! 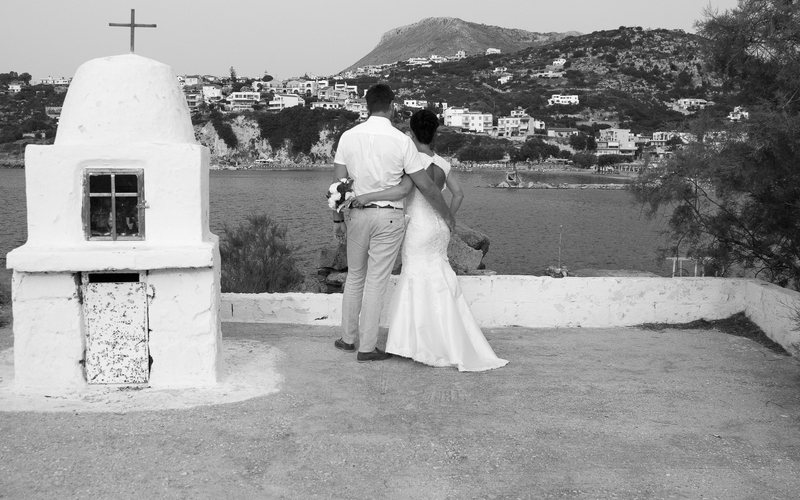 Two days after the wedding, Ash had to leave Crete and return to the UK for the start of his career training as an officer in the RAF. This brought another highly emotional day for Emma and Ash. They had barely had a moment to each other when they would have to part for at least seven weeks! It was so hard for Ash – leaving baby Ralph and Emma.. and he was in bits. Emma no less, was equally upset, despite knowing this was coming. It was made all the more poignant by happening so soon after their wedding day. Emma and Ralph came back with me that day and for the next few days, we were so glad that she was not on her own right then. With Zoe, Rich and Mum still at mine and lots of her friends and family staying for a few more days, she had plenty of love surrounding her. Zoe and Rich flew back the following Tuesday, as did many of my family but I didn’t take Emma back to the airport until the Saturday. I got another blissful week of playtime with cute and increasingly-active Grandson, Ralph! My Mum stayed an extra week until the Tuesday after, which was nice for me as I have had a gradual loss of family going rather than everybody leaving at the same time! After such a whirlwind few weeks, that really would have left me feeling very flat and so sad that it’s all over! 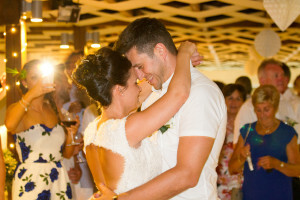 Whilst writing this post I have re-lived this wonderful day all over again and I am sure that in my memories, this day shall live on and on… Every time I look through the phographs Phil, the photographer took – they bring tears to my eyes. Phil has managed to capture the most emotional pictures of the day and tells such a beautiful story and we still have the video footage to look forward to seeing! I only wish I could have posted up more photos! I would like to thank all the people who worked behind the scenes to ensure that Emma and Ash’s Wedding was truly special. On a deeply personal note – It is at times like this that I reflect, as I often do, on how my family is everything to me. Emma and Ash’s Wedding has been a pivotal point and truly proud moment in my life – the proudest I have felt to date. 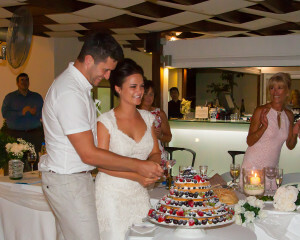 It is also the culmination and legacy of seven years of blissful happiness on this most beautiful Island of Crete. This entry was posted in Blog Posts and tagged Almyrida, Chania, Kokkino Chorio, Plaka by micmaryjo. Bookmark the permalink.